What are Hip Groin Disorders? Hip and groin disorders are more common in athletes and are caused by rapid acceleration and deceleration motion. The rehabilitation time for hip and groin injuries is longer than most other injuries, therefore early and accurate diagnosis is essential. 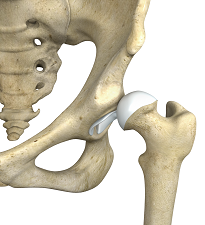 The management of hip and groin injuries is complex due to the presence of multiple anatomic structures in that region. Moreover, the signs and symptoms of most hip and groin disorders are similar, making the diagnosis difficult. The common sports that result in hip and groin injuries are those which require regular bending, kicking and turning movements such as soccer, ice hockey, basketball, football and tennis. In addition, sports that involve running can also cause hip and groin disorders. Hip pain, one of the common symptoms patients complain of, may not always be felt precisely over the hip joint. Pain may be felt in and around the hip joint and the cause for pain may be multifactorial. The exact position of your hip pain suggests the probable cause or underlying condition causing pain. Pain felt inside the hip joint or your groin area is more likely to be because of problems within the hip joint. Likewise, the pain felt on the outer side of your hip, upper thigh or buttocks may be a result of problems of the muscles, ligaments, tendons and soft tissues surrounding the hip joint. However certain disease conditions affecting other parts of your body such as the lower back or knees can also cause hip pain. The Treatment of hip and groin disorders includes physical therapy or exercise therapy, which includes different rehabilitation programs such as warm up, strengthening program and sport specific training. Along with exercises, medications may also be prescribed. Self-care and pain relieving anti-inflammatory medications offer symptomatic relief. However, the exact cause for the pain needs to be addressed. Practicing certain measures can avoid aggravation of the pain and improve your quality of life. Avoiding physical activities that may worsen the pain, stretching the quadriceps and hamstring muscles and performing warm up exercises before the actual exercise regimen may help to improve the condition. Applying ice packs over the region of pain for about 15 minutes three to four times daily reduces both pain and swelling. Surgery is considered in patients who fail to respond to a conservative line of management.